If you're looking for the best PrestaShop theme to build your online store, then this collection of our best-selling premium PrestaShop themes on ThemeForest will help you find what you seek. The best-selling premium themes include a wide range of features that will enable you build a powerful PrestaShop website. If you want to create a fully functioning online shop or just list a few items for sale on your website, most of the themes in this collection have good eCommerce capabilities. eMarket is a good-looking and multi-functional PrestaShop Theme. Built with +6 Homepage Layouts with many powerful functions, SP E-market can support and serve many different merchants from small to large. Integrating many powerful extensions, SP E-Market is promised to satisfy the most fastidious customers. TopDeal is an integrated of blocks. However, these blocks are combined together and become an modern and logical-looking theme. With a powerful Admin Panel, users can do more than they think about the name – TopDeal. Based on PrestaShop 1.7 and 1.6, TopDeal is suitable for many kinds of business: Fashion, Digital, Accessories or even the mixture of them. Destino is an elegant, modern and professional-looking eCommerce Prestashop website theme. The store theme is a very first PrestaShop 1.7 theme for building all sorts of online business websites: Digital, Electronics, Mobile, Fashion, Bags, Shoes and Accessories. Shopping – Stunning PrestaShop 1.7 Theme with a sharp layout, built to make your website look modern and professional. The design is well suited for all online retail stores, marketplaces, fashion store, cosmetics store, digital electronic shop, household appliances shop or any other categories. Market is an excellent theme with 04 modern, clean homepage layouts, new PrestaShop framework v2.0.0 and fully responsive design that makes it look perfect on any devices and screen resolutions. Furthermore, this incredible theme is integrated with many feature-rich add-ons and a huge variation. You are free to control this theme in order to make your store more friendly and adorable for your customers. Suitable for: clothing/fashion shop, hi-tech, electronics, mobile shop or other eCommerce shops with multi-category. Revo is a responsive eCommerce PrestaShop Theme with the modern and clean design. Furnicom is a modern responsive Prestashop, which can help you to create a professional eCommerce store with ease. 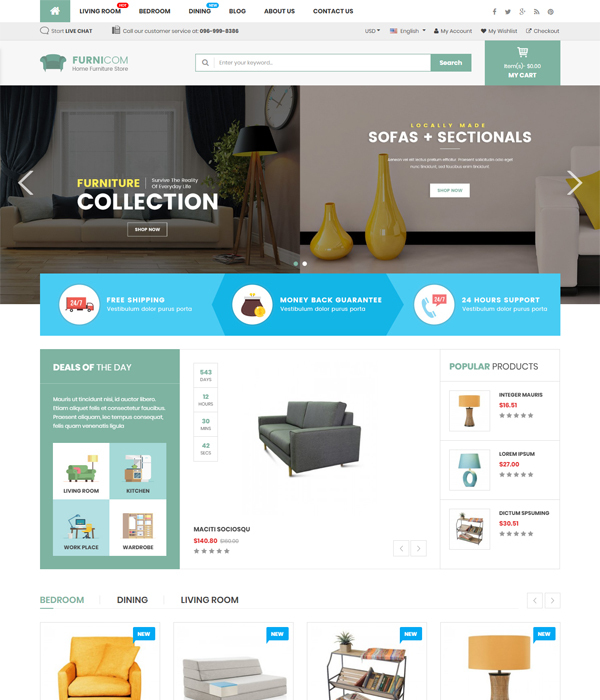 It is responsive, flexible theme crafted for furniture shop theme, interior stores and any Prestashop store. If you love simple but nice, this choice is the best for you. SP HiTheme is so clean and bright with smooth display. Do just look at the demo HomePage, think further, this theme is multipurpose that promotes you create any types of store businesses you run. ClickBoom is a multi-purpose PrestaShop Theme with 5+ trending homepages, which perfectly suited for selling digital, technology, computer, accessories, hi-tech products or any other products. These are our best-selling PrestaShop themes in 2018. Hope you enjoy this list! If you purchased these templates from us, please give us a hand to improve our products by taking very short survey.